Pedicraft canopy enclosed bed with head elevation crank allows one end of the mattress to be elevated up to 30º, enabling the patient to sit up in bed. 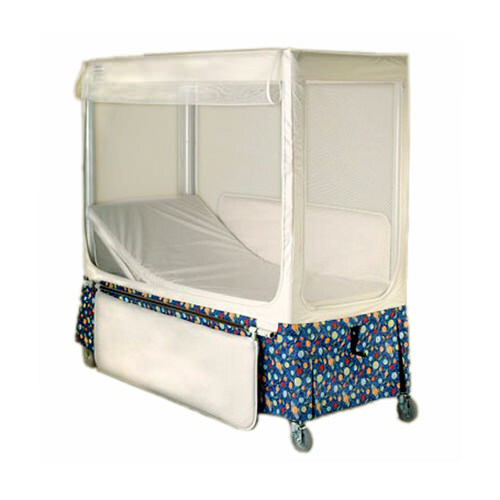 Every pedicraft canopy enclosure bed is constructed of strong polyester mesh and sure-chek healthcare vinyl. The vinyl of the enclosure is bacteria resistant and the cover can be removed for cleaning. Pedicraft canopy bed mattress is constructed of high density, fire-retardant foam covered in sure-chek comfort vinyl. Head elevation crank feature provides convenience for the caregiver when a patient needs frequent medical attention. Pedicraft canopy enclosure bed can be raised 10" by a hydraulic hand crank. Pedicraft enclosed canopy bed prevents child from climbing over the side and falling to the floor. Custom made skirts from fabric you purchase can be arranged, call us for details.. Installation & white glove delivery service available for clients in our local service area. Overall width including side rails 40" 48"
Overall height with leg extensions 85" 85"
Top of mattress to floor 27" 27"
With leg extensions: 37" 37"
Top of mattress to top of enclosure 49" 49"
Mattress thickness 3" & 2" 3" & 2"
Mattress length 3" 77" 77"
Mattress length 3" with padded head/foot 71" 71"
Mattress length 2” 76" 76"
Mattress length 2” with padded head/foot 73" 73"
User weight capacity 300 lbs. The Warranty that Pedicraft offers is of Three years for the frame & 90 days on Canopy & Mattress from the date of the purchase and it does not cover normal wear and tear, abuse or problems caused by using the product for other than that for which it was intended. Modifications to a product not done by Pedicraft Products may also invalidate the Warranty. Positively no returns accepted after 90 days from date of shipment. If any defect is found the purchaser must return the article per instructions and Pedicraft will replace, repair or refund the purchase price at its sole discretion. Any changes or modifications of the equipment by the purchaser will void these conditions of sale. Any extra costs resulting from failure to obtain prior shipping instructions from Pedicraft will be borne by the customer.